In the last two decades there have been studies claiming that science is becoming ever more interdisciplinary. However, the evidence has been anecdotal or partial. Here we investigate how the degree of interdisciplinarity has changed between 1975 and 2005 over six research domains. To do so, we compute well-established bibliometric indicators alongside a new index of interdisciplinarity (Integration score, aka Rao-Stirling diversity) and a science mapping visualization method. The results attest to notable changes in research practices over this 30 year period, namely major increases in number of cited disciplines and references per article (both show about 50% growth), and co-authors per article (about 75% growth). However, the new index of interdisciplinarity only shows a modest increase (mostly around 5% growth). Science maps hint that this is because the distribution of citations of an article remains mainly within neighboring disciplinary areas. 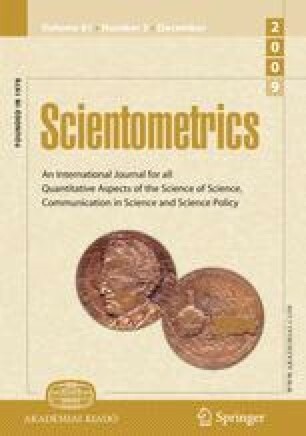 These findings suggest that science is indeed becoming more interdisciplinary, but in small steps — drawing mainly from neighboring fields and only modestly increasing the connections to distant cognitive areas. The combination of metrics and overlay science maps provides general benchmarks for future studies of interdisciplinary research characteristics. Bategelj, V., Mrvar, A. (2008), Pajek. Program for Large Network Analysis. http://vlado.fmf.unilj.si/pub/networks/pajek/ Accessed 15-01-2008.